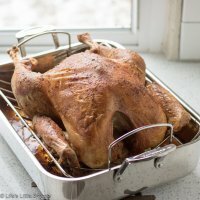 How to Roast a Turkey – Roasted Turkey is a savory and delicious staple recipe that every cook should know especially for Thanksgiving and Christmas. 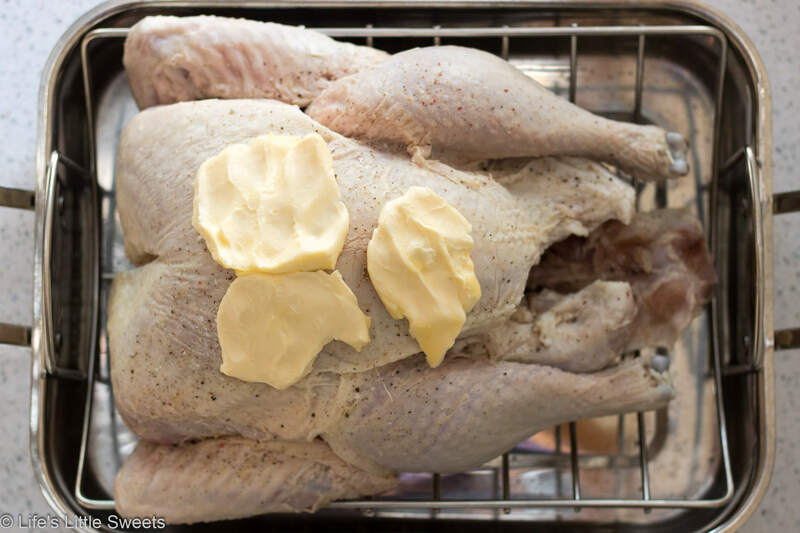 The recipe only requires turkey, unsalted butter, stock, salt, pepper and optional ingredients and is actually very simple to make! Hi Everyone, it’s time to make Roasted Turkey! Before I became married with my own family, Thanksgiving used to roll around every year and the Thanksgiving turkey (and sometimes for Christmas) would magically appear (made by others, of course). A dish that takes up so much real estate on the holiday (or regular dinner) table might seem intimidating but I assure you, when you break down all the steps, it is actually incredibly easy. Now that I have my own family with children and we host dinner during the holidays, I have had the opportunity to make many a turkey dinner. 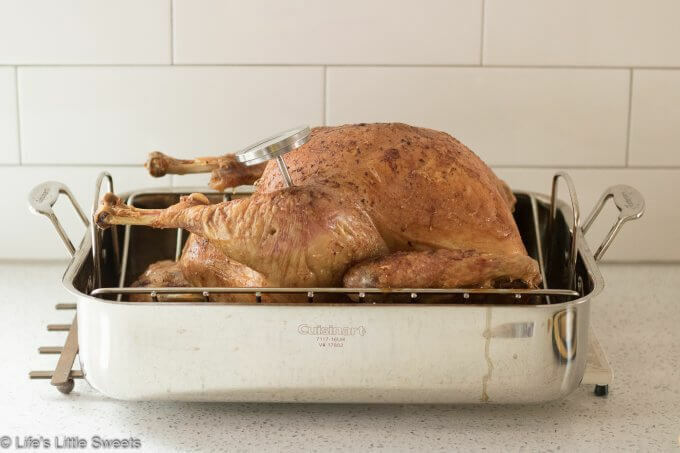 I have tried different methods over the years but today, I am going to outline the simplest, most straight-forward way to make a Roasted Turkey. 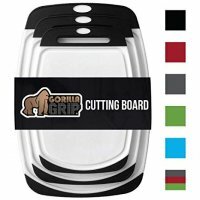 You won’t believe how simple it actually is. 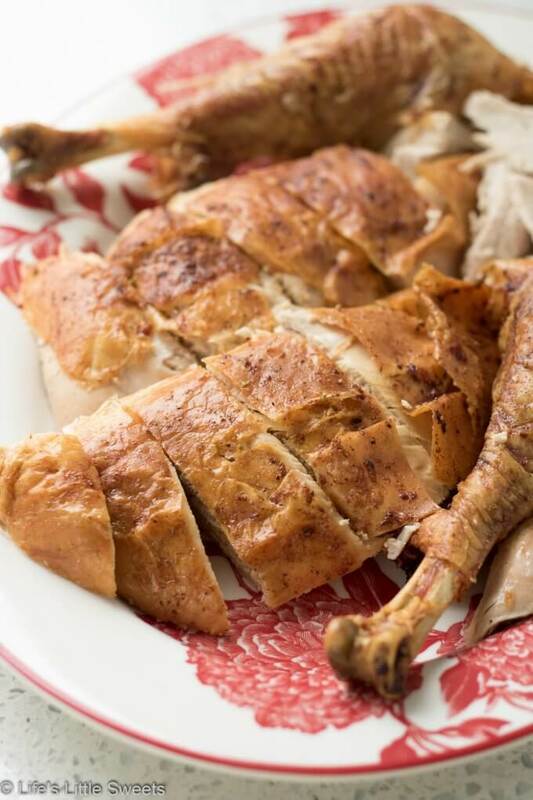 I sometimes make turkey on non-holiday dinners because it makes plenty to eat and makes great leftovers (think soups, sandwiches, chili, etc.). 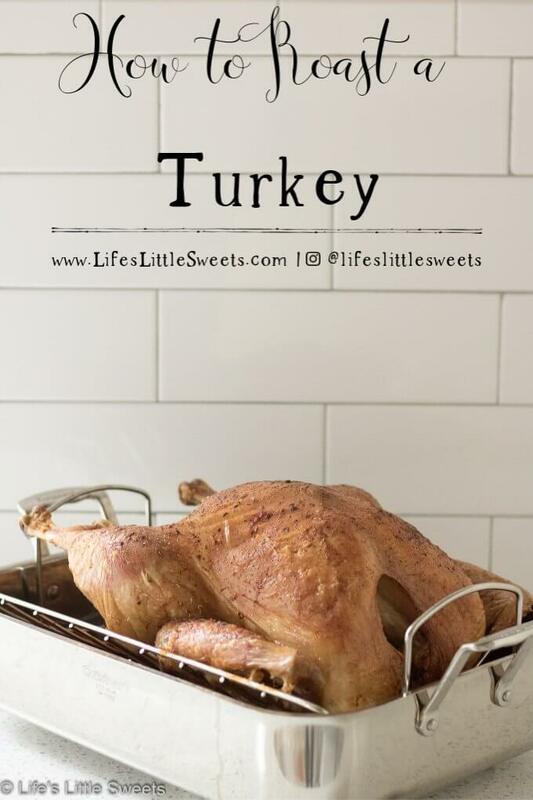 Pretty soon, you might just find yourself leaning on making turkey more than once or twice a year too! I suggest not trussing (tying them together) the legs to allow the air to circulate in the cavity and cook at the meat better. 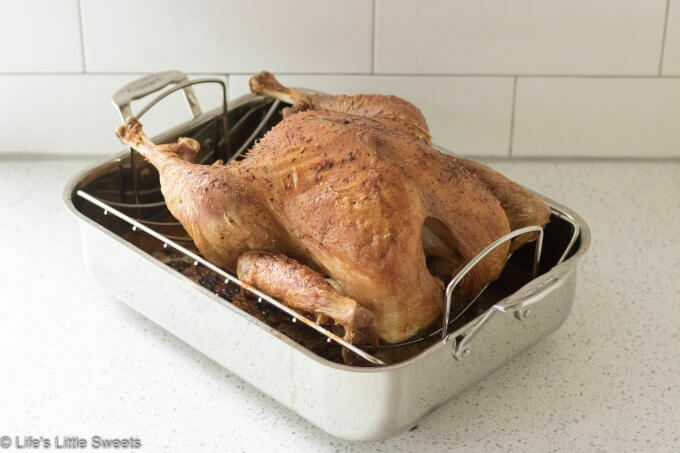 When roasting chicken I would truss the legs because it’s a much smaller bird and the legs might overcook but with a turkey I do not have that concern. 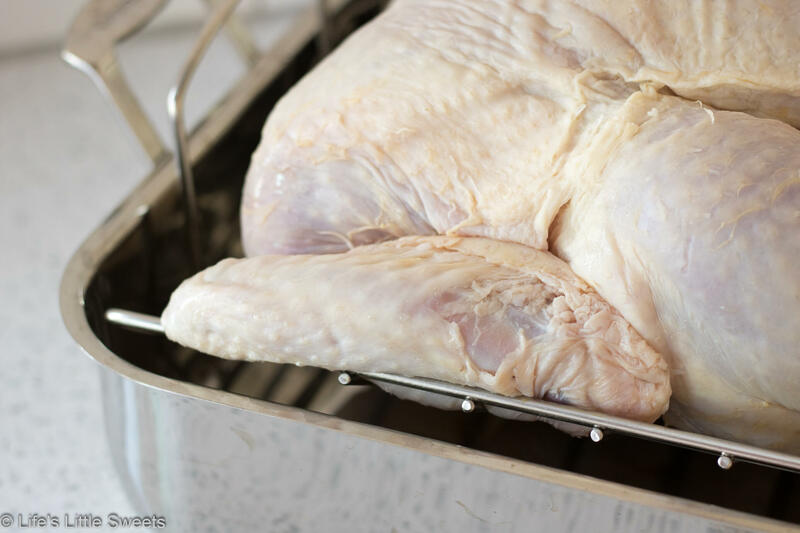 When you think the turkey is done, make sure to measure the temperature of the turkey in the thickest part of the thigh and breast before you consider it done. 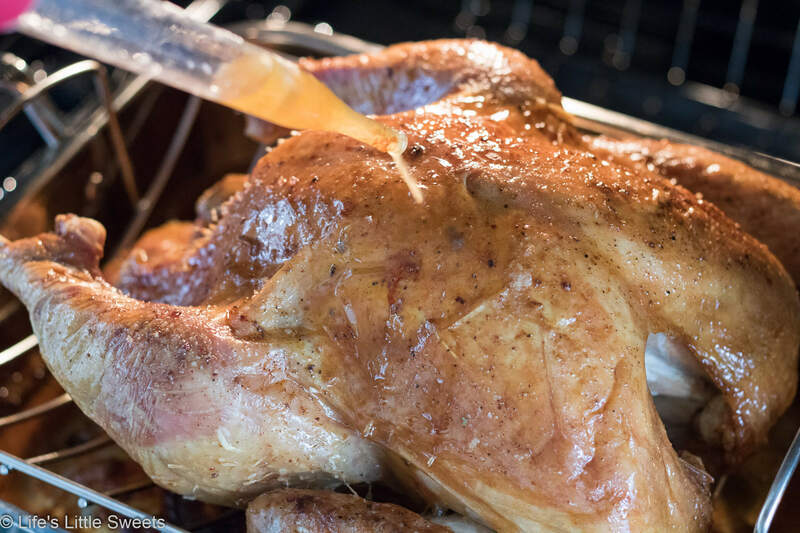 The temperature for poultry should be 165 degrees F when done. Make sure you let the turkey rest for at least 15-20 minutes before carving to allow all the juices to stay in the meat. 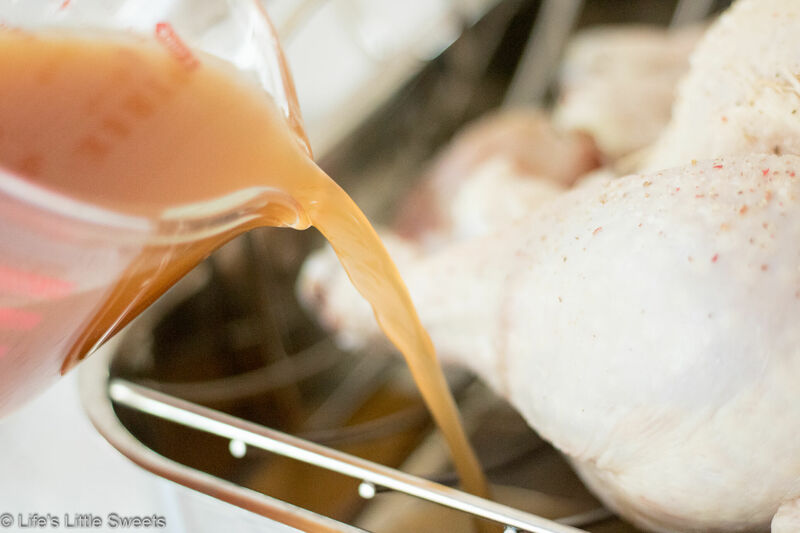 This gives you time to make the gravy with the pan drippings, if you chose to do so! I call for unsalted butter in this recipe because it gets the skin a lovely golden brown color with crispy skin. You can absolutely, substitute regular olive oil, if you prefer. 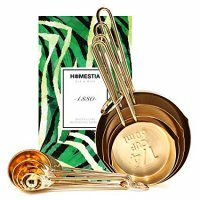 I would suggest reading through the recipe and all the notes before starting this recipe, in the recipe card below. If you have any concerns about making Roasted Turkey, remember, you can think of turkey as just a big chicken! 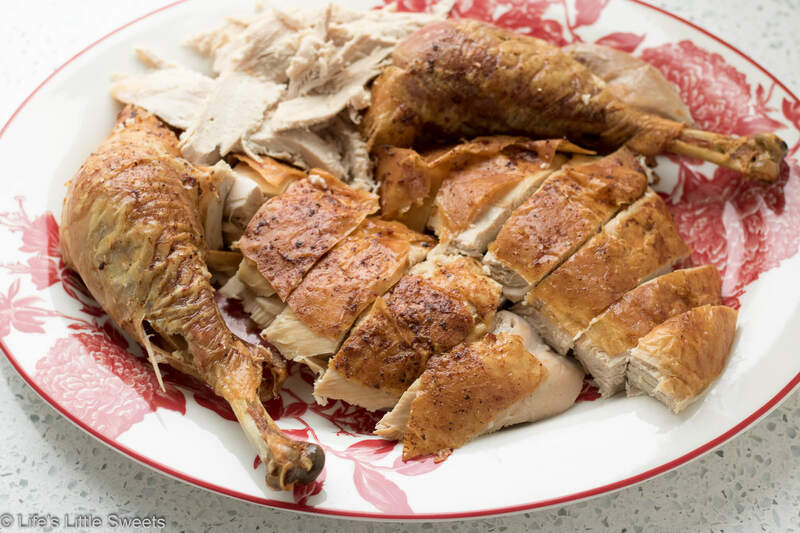 Roasted Turkey is a savory and delicious staple recipe that every cook should know especially for Thanksgiving and Christmas. The recipe only requires turkey, unsalted butter, stock, salt, pepper and optional ingredients and is actually very simple to make! Pat the turkey dry with paper towels. Discard paper towels. Place the turkey in the roasting pan. 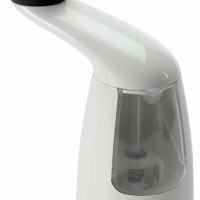 Remove the giblets and neck, either save for use or discard. Tuck the wings behind the turkey's shoulders. At this point, if you want to add the optional ingredients, you can add them to the turkey's cavity. Sprinkle Kosher salt and fresh ground black pepper all over the turkey. Add the butter on the top of the turkey. Add 2 cups of chicken broth (or vegetable broth or water) to the bottom of the pan. 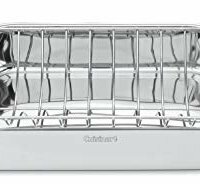 Place the roasting pan with the prepared turkey in the center rack of the preheated oven. Close the door. Reduce the heat to 350 degrees F. Bake for 13 minutes per pound, so a 13-14 pound turkey should be done under just under 3 hours. 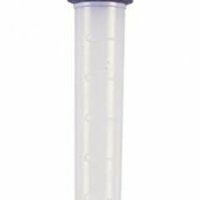 Using a turkey baster, you can baste the liquids over the top of the turkey every 45 minutes. 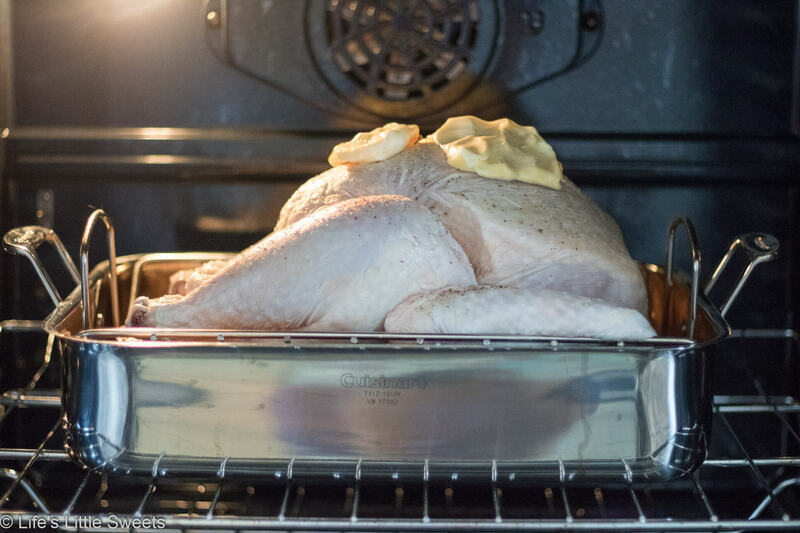 As the turkey get's close to being done, keep an eye one it, if the top looks too brown, you can use a foil tent to protect the top from over-browning. 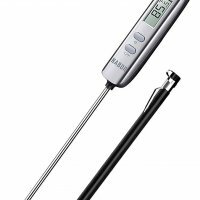 When you think the turkey is done, using a meat thermometer, check the thickest part of the breast and thigh. 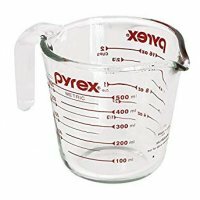 It should be at 165 degrees F when done. Allow the turkey to rest for 15-20 minutes before carving. I suggest not truss the turkey legs to allow the air to circulate in the cavity and cook at the meat. 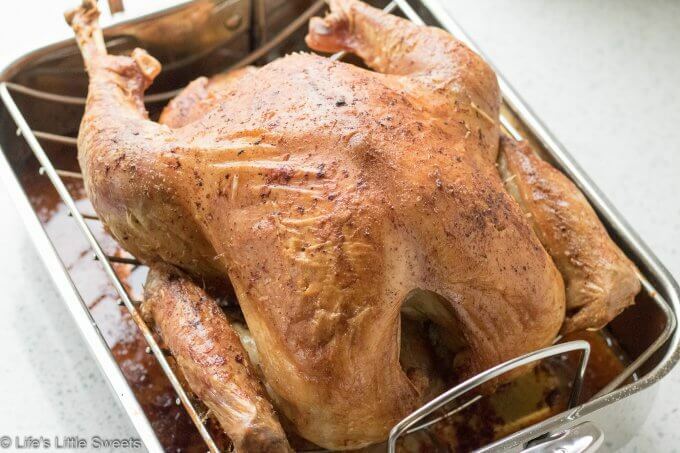 This recipe is based and works best for on a 13-14 (max 16) pound turkey. 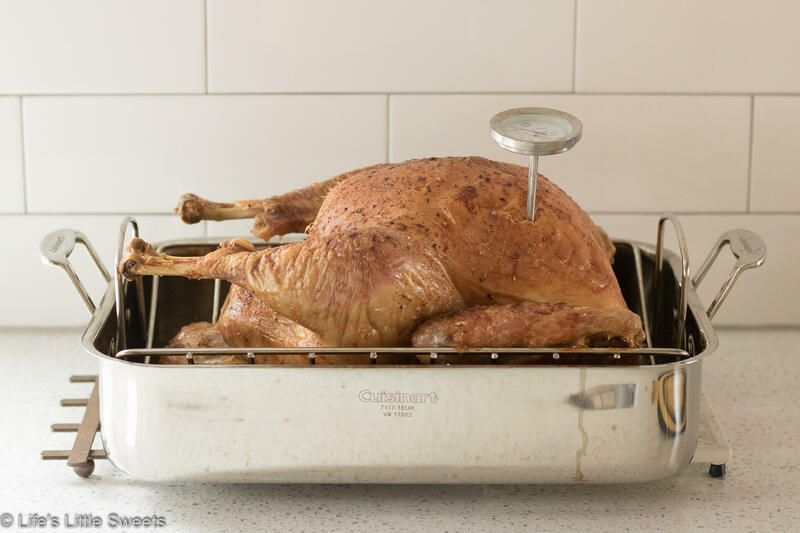 Generally, you want to roast the turkey 13 minutes per pound, you can use this metric to calculate how long to roast your turkey based on it's weight. 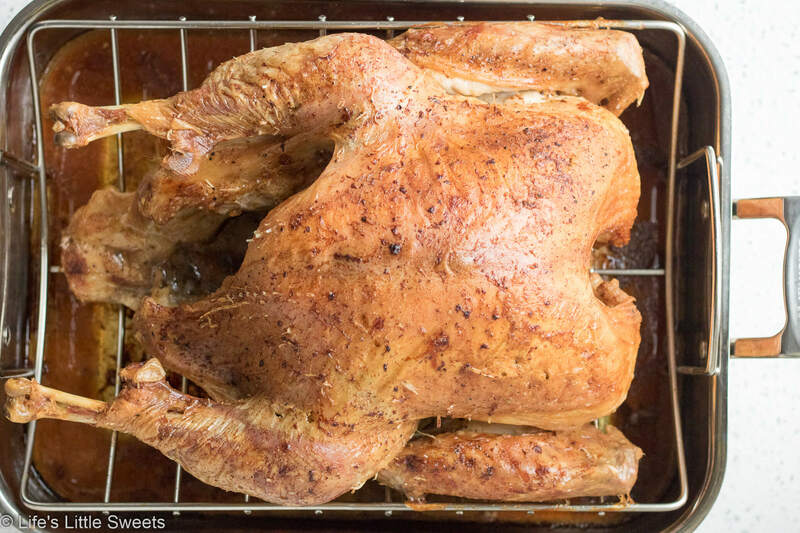 The turkey in this recipe took just under 3 hours to roast. 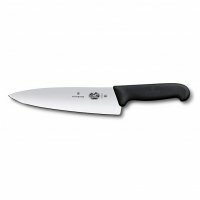 Make sure to measure the temperature of the turkey in the thickest part of the thigh and breast before you consider it done. 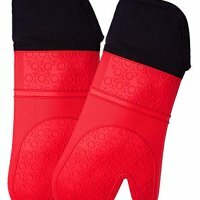 The temperature for poultry should be 165 degrees F when done. Make sure you let the turkey rest for at least 15 minutes before carving. 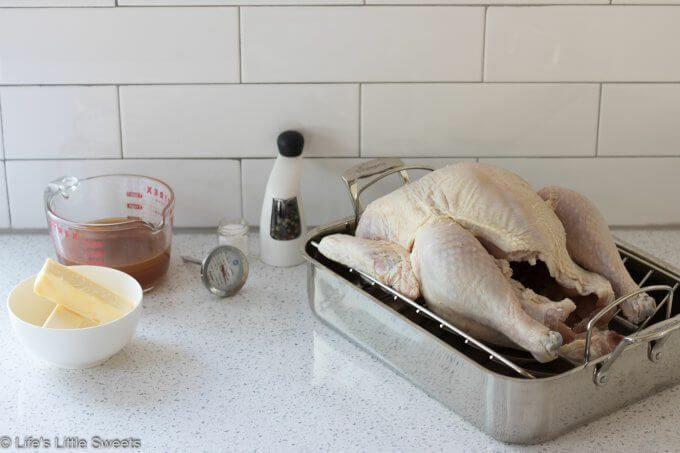 Fresh turkeys generally cook faster than frozen, thawed turkeys, so be sure to keep an eye on the turkey as it gets close to being done and you might want to check on it with the meat thermometer earlier. if you have any leftovers, be sure to wrap them up in air-tight container(s). It's important not to leave out food to avoid food-borne illness.